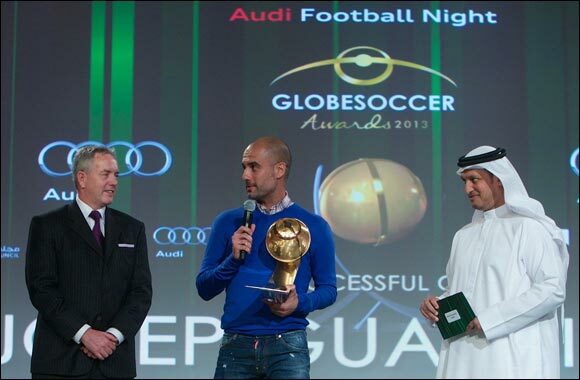 Dubai, 31 December 2013 – The fourth annual Audi Football Night welcomed many of the game's most recognised names, including Josep Guardiola, Bayern Munich Coach; Antonio Conte, FC Juventus Coach; and Frank Ribéry from Bayern Munich. Presented by Al Nabooda Automobiles, the official dealer for Audi in Dubai and the Northern Emirates, the star-studded awards ceremony took place at Madinat Jumeirah on 29 December. The ceremony is part of the prestigious Globe Soccer annual meeting dedicated to leading transfer market operators. An illustrious awards panel comprising top sport representatives including Sheikh Mohamed Bin Juma Al Maktoum, Mohamed Al Kamali, Secretary General of the UAE National Olympic Committee, H.E. Dr. Ahmad Al Sharif, Secretary General of Dubai Sports Council, and former England manager Fabio Capello decided the winners in each of the categories. Josep Guardiola was honored with the Audi sponsored “Most Successful Coach award”, while UAE football hero, Mahdi Ali took home the “Best Coach in the GCC” award. Other winners on the night were Frank Ribery, Best Player of the Year; Bayern Munich, Best Club of the Year; and Juma Gareeb, who was awarded the Special Coach Career Award. Organized by BC Bendoni Communication in collaboration with the Dubai Sports Council, Globe Soccer has become one of football's most exclusive events, and for the first time this year has partnered with the Rashid Paediatric Therapy Centre with which to collaborate on the new “Globe Soccer Dream for Children” charity project. The conference and event is dedicated to the football market operators who, together with the clubs, leagues, federations and football institutions, are able to extend their network of contacts and bring themselves up to date with the most important current issues.